Welcome to the 2019 edition! Pedal for Kids is now in its 28th year. This event was created by Sylvie Lalumière and Michael Conway to fundraise in memory of their daughter Meagan, who had been treated at the Montreal Children’s Hospital. 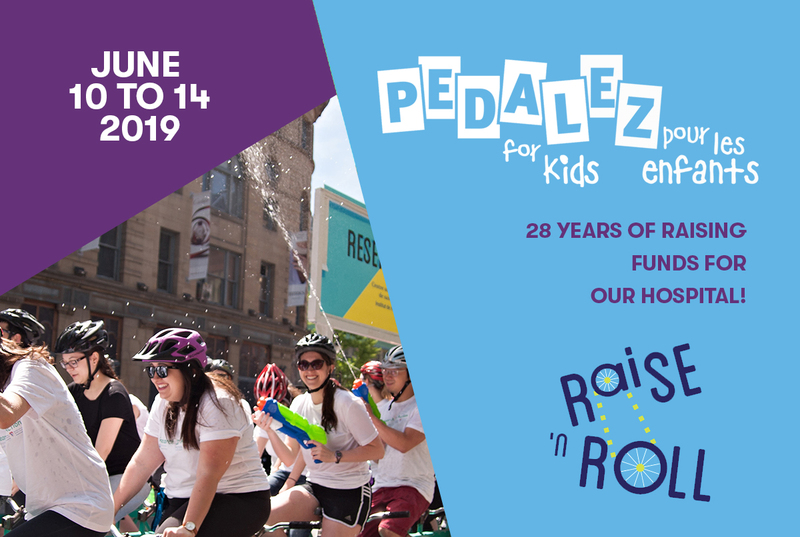 Participants are invited to celebrate their fundraising efforts by hopping on our custom bike built for 30 riding through the streets of downtown Montreal. It’s a great team-building event that mobilizes hundreds of individuals, companies and community groups each year to raise funds for the Montreal Children’s Hospital. All donations of the 28th edition will be allocated to the Craniofacial Surgery Department of the Montreal Children’s Hospital, to treat children with craniofacial anomalies (affecting the bones of the skull and face) and develop complex care plans for patients to offer each child the safest and most advanced surgical treatment possible. The families of children born with the anomalies can be confident that their child will be evaluated by a specialized pediatrician. To learn more about the activities of this department, click here.